Charybdis Wellisk is one of the two cards in the set that has a Greek work - Chimera being the other Greek card. 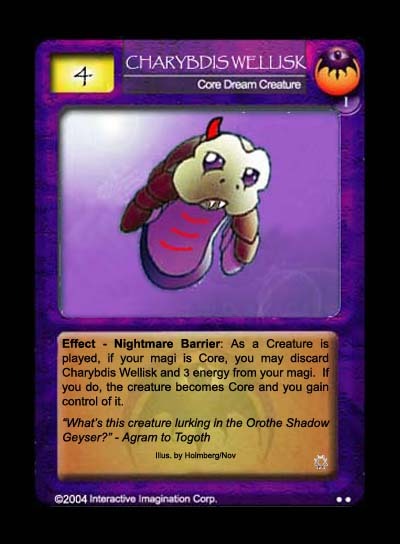 Few people would realise that this card has links to Mike Welling as well - the demon's horn was inspired by Welling's demonic picture and Wellisk is of course synonymous with Welling. Theft is a theme common to both Orothe and Core and the Charybdis Wellisk, originally being Orothe/Core was given a creature theft power. However playtesting proved that the theft power is too overpowered outside Core and the card was restricted to Core itself. The artwork is a photoshop Wellisk Pup.